DTG is Direct to Garment Printing which is exactly like it sounds. Oversized Inkjet-style printers equipped with specialized textile ink, print directly onto garments & other materials. While it can only print one garment at a time, it does it quickly and with superb detail. What are the Benefits of DTG? There are no minimum quantities, setup charges or screen fees. Because we use digital art files, we are able to print photo-quality with no color limitations. With DTG you can print as many colors in a single pass as your art/design requires - at no additional charge. What Garments/Materials work best for DTG? DTG Printing uses water-based ink which is formulated to grab onto Natural Fibers made from materials that have grown from the ground such as Cotton, Hemp, Bamboo and Linen. Synthetic materials like Polyester and Rayon (included in bi-blend and tri-blend garments) have a fiber structure that is not compatible with water based ink. This affects the longevity of the print, causing it to fade at a much faster rate than prints done on natural fiber materials. Why are Dark & Colored materials more costly to produce? To achieve the best quality, Black & Colored fabrics require several additional steps. First they must be pre-treated, dried & pressed prior to printing. Additionally, an underbase of White ink must be printed to ensure the design maintains its color integrity. White fabrics require no pre-treatment or underbase so they take less time & material to produce. 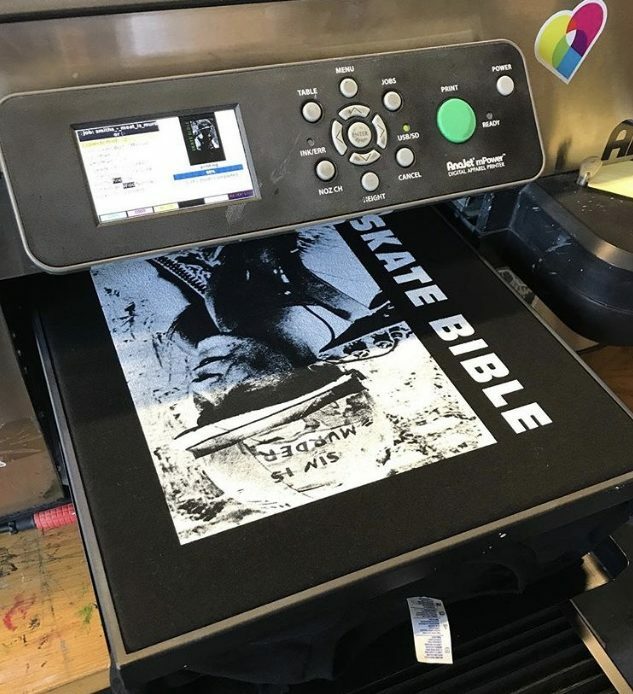 Underbase is a layer of white ink that is printed onto a black or colored garment to help maintain your design's color integrity. Without it, the shirt's color would alter effects the hue and vibrancy of the ink as it is laid on the shirt directly. All non-white garments print a white underbase before the color artwork layer by default. Black shirts, or any very dark shirt MUST have an underbase in order for the artwork to appear on the shirt. Attempting to print on colored shirts without an underbase only works to achieve a vintage or faded look on lighter colored shirts, such as light blues, yellows, tans, light greys, pinks, etc. We can't guarantee the results if you choose “no underbase” on colored shirts. When printing on a White garment, there is no need for white ink. Any portion of the design that requires white, will come from the actual shirt itself. What is the Maximum Print Size for DTG? We require Print Ready Art, correctly sized and formatted and ready to print as-is with no changes or alterations. We do not resize artwork to match mockups. If any changes or alterations are requested, an art charge of $25./per half hour may apply. Click here for more information on Art Preparation. Need an Estimate? Email us your artwork along with sizing and the material you want use and we'll help you decide if DTG Printing is best for your project!